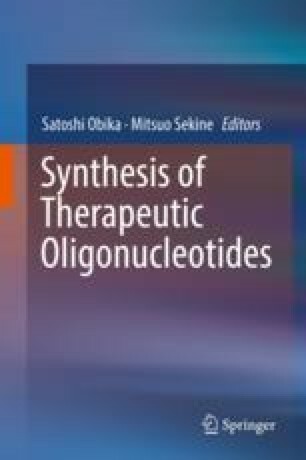 Nucleosides containing 2-thiothymine and 2-thiouracil as base moieties have been incorporated into oligonucleotides to enhance their hybridization affinity and base discrimination ability. For the incorporation of these thio-bases into oligonucleotides, efficient methods for the synthesis of thio-modified nucleosides and the incorporation of the thio-nucleosides into oligonucleotides under solid-phase conditions are necessary. In this chapter, the physicochemical properties of thio-modified bases and the methods for the syntheses of 2-thiouridine and 2-thiothymidine are described. In addition, the solid-phase synthesis of oligonucleotides incorporating these thio-nucleosides is described.